Unless you have been living on another planet, you will know that today there will be an eclipse of the Sun although from the UK it will be rather underwhelming, as only about 4% of the Sun’s disk will be covered by the moon; for totality you have to be in the United States. For the record, however, the eclipse will begin 15:46 GMT on August 21 out over the Pacific. It will reach the coast of Oregon at Lincoln City, just west of Salem, at 16:04 GMT (09:04 local time) where it will reach its maximum at 17:17 GMT (10:17 local time). The path of totality will then track right across the United States to South Carolina. For more details see here. Best wishes to all who are hoping to see this cosmic spectacle! 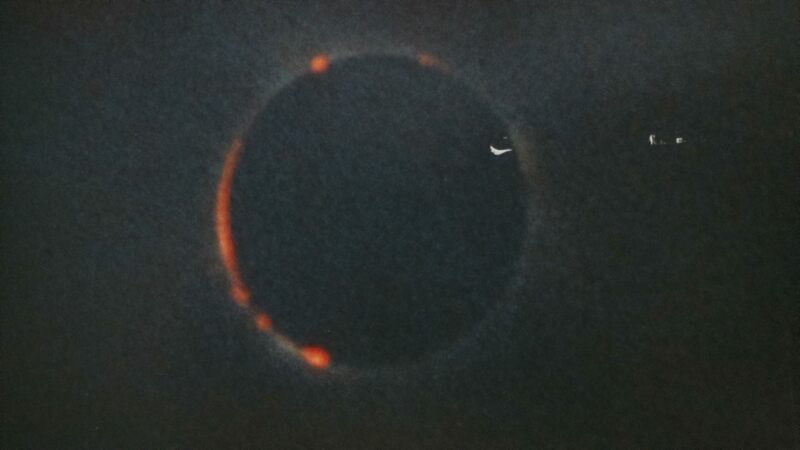 I saw the total eclipse of August 11, 1999 from Alderney in the Channel Islands, and it was a very special experience. 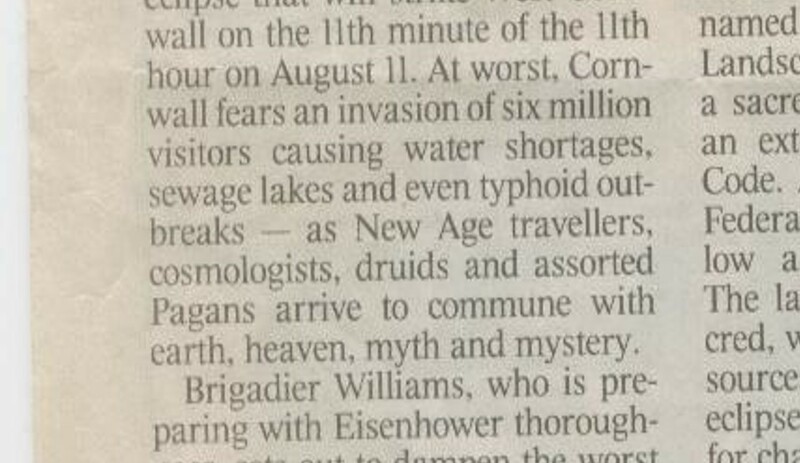 I did write a letter to the Times complaining that, as a cosmologist, I felt this was very insulting to druids. They didn’t publish it. This provides me with a good excuse to repost an old item about the famous expedition during which, on 29th May 1919, measurements were made that have gone down in history as vindicating Einstein’s (then) new general theory of relativity. I’ve written quite a lot about this in past years, including a little book and a slightly more technical paper. I decided, though, to post this little piece which is based on an article I wrote some years ago for Firstscience. A total eclipse of the Sun is a moment of magic: a scant few minutes when our perceptions of the whole Universe are turned on their heads. The Sun’s blinding disc is replaced by ghostly pale tentacles surrounding a black heart – an eerie experience witnessed by hundreds of millions of people throughout Europe and the Near East last August. But one particular eclipse of the Sun, eighty years ago, challenged not only people’s emotional world. It was set to turn the science of the Universe on its head. For over two centuries, scientists had believed Sir Isaac Newton’s view of the Universe. Now his ideas had been challenged by a young German-Swiss scientist, called Albert Einstein. The showdown – Newton vs Einstein – would be the total eclipse of 29 May 1919. Newton’s position was set out in his monumental Philosophiae Naturalis Principia Mathematica, published in 1687. The Principia – as it’s familiarly known – laid down a set of mathematical laws that described all forms of motion in the Universe. These rules applied as much to the motion of planets around the Sun as to more mundane objects like apples falling from trees. 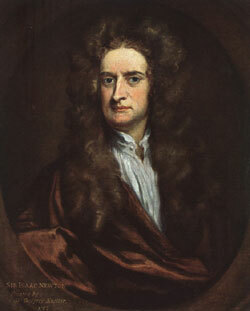 At the heart of Newton’s concept of the Universe were his ideas about space and time. Space was inflexible, laid out in a way that had been described by the ancient Greek mathematician Euclid in his laws of geometry. To Newton, space was the immovable and unyielding stage on which bodies acted out their motions. Time was also absolute, ticking away inexorably at the same rate for everyone in the Universe. For over 200 years, scientists saw the Cosmos through Newton’s eyes. It was a vast clockwork machine, evolving by predetermined rules through regular space, against the beat of an absolute clock. This edifice totally dominated scientific thought, until it was challenged by Albert Einstein. In 1905, Einstein dispensed with Newton’s absolute nature of space and time. Although born in Germany, during this period of his life he was working as a patent clerk in Berne, Switzerland. He encapsulated his new ideas on motion, space and time in his special theory of relativity. But it took another ten years for Einstein to work out the full consequences of his ideas, including gravity. The general theory of relativity, first aired in 1915, was as complete a description of motion as Newton had prescribed in his Principia. But Einstein’s description of gravity required space to be curved. Whereas for Newton space was an inflexible backdrop, for Einstein it had to bend and flex near massive bodies. This warping of space, in turn, would be responsible for guiding objects such as planets along their orbits. Albert Einstein (left), pictured with Arthur Stanley Eddington (right). Picture Credit: Royal Greenwich Observatory. By the time he developed his general theory, Einstein was back in Germany, working in Berlin. But a copy of his general theory of relativity was soon smuggled through war-torn Europe to Cambridge. There it was read by Arthur Stanley Eddington, Britain’s leading astrophysicist. Eddington realised that Einstein’s theory could be tested. If space really was distorted by gravity, then light passing through it would not travel in a straight line, but would follow a curved path. The stronger the force of gravity, the more the light would be bent. The bending would be largest for light passing very close to a very massive body, such as the Sun. 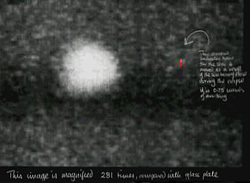 Unfortunately, the most massive objects known to astronomers at the time were also very bright. This was before black holes were seriously considered, and stars provided the strongest gravitational fields known. The Sun was particularly useful, being a star right on our doorstep. But it is impossible to see how the light from faint background stars might be bent by the Sun’s gravity, because the Sun’s light is so bright it completely swamps the light from objects beyond it. 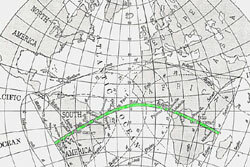 A scientific sketch of the path of totality for the 1919 eclipse. Picture Credit: Royal Greenwich Observatory. Eddington realised the solution. Observe during a total eclipse, when the Sun’s light is blotted out for a few minutes, and you can see distant stars that appear close to the Sun in the sky. If Einstein was right, the Sun’s gravity would shift these stars to slightly different positions, compared to where they are seen in the night sky at other times of the year when the Sun far away from them. The closer the star appears to the Sun during totality, the bigger the shift would be. But at this point the story took a twist. Eddington was a Quaker and, as such, a pacifist. In 1917, after disastrous losses during the Somme offensive, the British government introduced conscription to the armed forces. Eddington refused the draft and was threatened with imprisonment. In the end, Dyson’s intervention was crucial persuading the government to spare Eddington. His conscription was postponed under the condition that, if the war had finished by 1919, Eddington himself would lead an expedition to measure the bending of light by the Sun. The rest, as they say, is history. 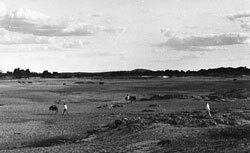 Meanwhile, at Sobral, Crommelin had much better weather – but he had made serious errors in setting up his equipment. He focused his main telescope the night before the eclipse, but did not allow for the distortions that would take place as the temperature climbed during the day. Luckily, he had taken a backup telescope along, and this in the end provided the best results of all. After the eclipse, Eddington himself carefully measured the positions of the stars that appeared near the Sun’s eclipsed image, on the photographic plates exposed at both Sobral and Principe. He then compared them with reference positions taken previously when the Hyades were visible in the night sky. The measurements had to be incredibly accurate, not only because the expected deflections were small. The images of the stars were also quite blurred, because of problems with the telescopes and because they were seen through the light of the Sun’s glowing atmosphere, the solar corona. Before long the results were ready. Britain’s premier scientific body, the Royal Society, called a special meeting in London on 6 November. Dyson, as Astronomer Royal took the floor, and announced that the measurements did not support Newton’s long-accepted theory of gravity. Instead, they agreed with the predictions of Einstein’s new theory. The final proof: the small red line shows how far the position of the star has been shifted by the Sun’s gravity. Each star experiences a tiny deflection, but averaged over many exposures the results definitely support Einstein’s theory. Picture Credit: Royal Greenwich Observatory. The press reaction was extraordinary. Einstein was immediately propelled onto the front pages of the world’s media and, almost overnight, became a household name. There was more to this than purely the scientific content of his theory. After years of war, the public embraced a moment that moved mankind from the horrors of destruction to the sublimity of the human mind laying bare the secrets of the Cosmos. 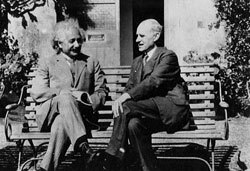 The two pacifists in the limelight – the British Eddington and the German-born Einstein – were particularly pleased at the reconciliation between their nations brought about by the results. Nowadays astronomers are so confident of Einstein’s theory that they rely on the bending of light by gravity to make telescopes almost as big as the Universe. When the conditions are right, gravity can shift an object’s position by far more than a microscopic amount. The ideal situation is when we look far out into space, and centre our view not on an individual star like the Sun, but on a cluster of hundreds of galaxies – with a total mass of perhaps 100 million million suns. The space-curvature of this immense ‘gravitational lens’ can gather the light from more remote objects, and focus them into brilliant curved arcs in the sky. 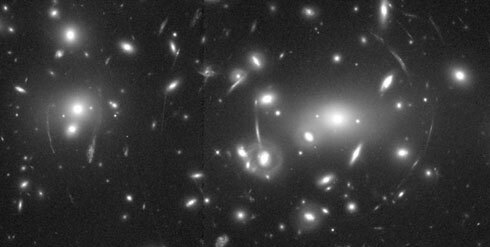 From the size of the arcs, astronomers can ‘weigh’ the cluster of galaxies. Einstein didn’t live long enough to see through a gravitational lens, but if he had he would definitely have approved…. This will take the form of a dialogue/discussion/debate between two leading cosmologists taking a `big picture’ view of the state of cosmology now and likely future developments. I’m sure it will be very friendly so I won’t use any form of language that suggests confrontation but it features, in the red corner, George Efstathiou of the University of Cambridge and, in the blue corner, Ofer Lahav of University College London. I recommend anyone attending this Euclid meeting and indeed anyone with a passing interest in cosmology to read that paper – it’s very different from what you might probably imagine it to be! The link is to an excellent piece about the history of European science which I recommend reading; as I do with this one. I won’t pretend to be a historian but I can’t resist a comment from my perspective as a physicist. I am currently teaching a course module called Theoretical Physics which brings together some fairly advanced mathematical techniques and applies them to (mainly classical) physics problems. It’s not a course on the history of physics, but thenever I mention a new method or theorem I always try to say something about the person who gave it its name. In the course of teaching this module, therefore, I have compiled a set of short biographical notes about the people behind the rise of theoretical physics (mainly in the 19th Century). I won’t include them here – it would take too long – but a list makes the point well enough: Laplace, Poisson, Lagrange, Hamilton, Euler, Cauchy, Riemann, Biot, Savart, d’Alembert, Ampère, Einstein, Lorentz, Helmholtz, Gauss, etc etc. There are a few British names too including the Englishmen Newton and Faraday and the Scot Maxwell. Hamilton, by the way, was Irish. Another Englishman, George Green, crops up quite prominently too, for reasons which I will expand upon below. Sir Isaac Newton is undoubtedly one of the great figures in the History of Science, and it is hard to imagine how physics might have developed without him, but the fact of the matter is that for a hundred years after his death in 1727 the vast majority of significant developments in physics took place not in Britain but in Continental Europe. It’s no exaggeration to say that British physics was moribund during this period and it took the remarkable self-taught mathematician George Green to breath new life into it. Green was the son of a Nottingham miller who, amazingly, taught himself mathematics and did most of his best work, especially his remarkable Essay on the Application of mathematical Analysis to the theories of Electricity and Magnetism (1828) before starting his studies as an undergraduate at the University of Cambridge ,which he did at the age of 30. Lacking independent finance, Green could not go to University until his father died, whereupon he leased out the mill he inherited to pay for his studies. Unfortunately, Green’s great pre-Cambridge work on mathematical physics didn’t reach wide circulation in the United Kingdom until after his death. William Thomson, later Lord Kelvin, found a copy of Green’s Essay in 1845 and promoted it widely as a work of fundamental importance. This contributed to the eventual emergence of British theoretical physics from the shadow cast by Isaac Newton. This renaissance reached one of its heights just a few years later with the publication a fully unified theory of electricity and magnetism by James Clerk Maxwell. 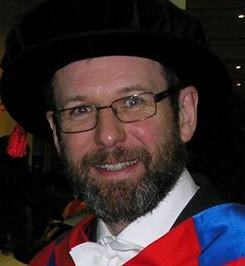 In a very real sense it was Green’s work that led to the resurgence of British physics during the later stages of the 19th Century, and it was the fact that he taught himself from French books that enabled him to bypass the insular attitudes of British physicists of the time. No physicist who has taken even a casual look at the history of their subject could possibly deny the immense importance of mainland Europe in providing its theoretical foundations. Of course science has changed in the last two hundred years, but I believe that we can still learn an important lesson from this particular bit of history. Science moves forward when scientists engage with ideas and information from as wide a range of sources as possible, and it stagnates when it retreats into blinkered insularity. The European Union provides all scientific disciplines with a framework within which scientists can move freely and form transnational collaborations for the mutual benefit of all. We need more of this, not less. And not just in science. I used to work at Queen Mary, but haven’t been back for a while. The college and environs have been smartened up quite a lot since I used to be there, as seems to be the case for the East End generally. I doubt if I could afford to live there now! Owing to a little local difficulty which I won’t go into, I was running a bit late so I missed the morning session. I did, however, arrive in time to see my former colleague Bangalore Sathyaprakash from Cardiff talking about gravitational waves, Jim Hough from Glasgow talking about experimental gravity – including gravitational waves but also talking about the puzzling state of affairs over “Big G” – and Pedro Ferreira from Oxford whose talk on “Cosmology for the 21st Century” gave an enjoyable historical perspective on recent developments. The talks were held in the Great Hall in the People’s Palace on Mile End Road, a large venue that was pretty full all afternoon. I’m not sure whether it was the District/Hammersmith & City Line or the Central Line (or both) that provided the atmospheric sound effects, especially when Jim Hough described the problems of dealing with seismic noise in gravitational experiments and a train rumbled underneath right on cue. UPDATE: Thanks to Bryn’s comment (below) I looked at a map: the Central Line goes well to the North whereas the District and Hammersmith & City Line go directly under the main buildings adjacent to Mile End Road. This session was aimed at a more popular audience and was attended by more than a few A-level students. John’s talk was very nice, taking us through all the various cosmological models that have been developed based on Einstein’s theory of General Relativity. Finally, topping the bill, was Sir Roger Penrose whose talk was engagingly lo-tech in terms of visual aids but aimed at quite a high level. His use of hand-drawn transparencies was very old-school, but a useful side-effect was that he conveyed very effectively how entropy always increases with time. Penrose covered some really interesting material related to black holes and cosmology, especially to do with gravitational entropy, but my heart sank when he tried at the end to resurrect his discredited “Circles in the Sky” idea. I’m not sure how much the A-level students took from his talk, but I found it very entertaining. The conference carries on today, but I couldn’t attend the Sunday session owing to pressure of work. Which I should be doing now! P.S. I’ll say it before anyone else does: yes, all the speakers I heard were male, as indeed were the two I missed in the morning. I gather there was one cancellation of a female speaker (Alessandra Buonanno), for whom Sathya stood in. But still. The 25th November 1915 was the date on which Einstein presented the “final” form of his theory to the Prussian Academy of Sciences. 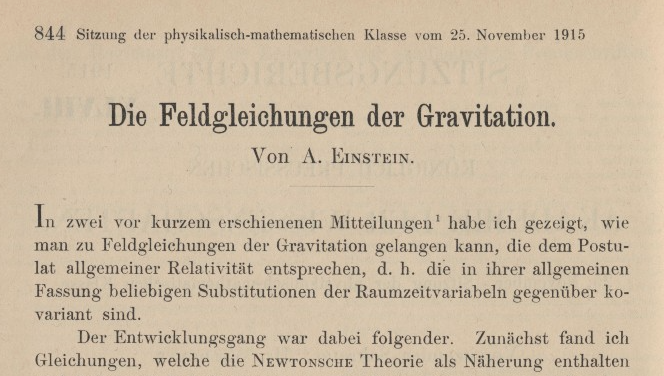 You can find a full translation of the paper “The Field Equations of Gravitation” here. You will see that he refers to a couple of earlier papers in that work, but I think this one is the first presentation of the full theory. It fascinated me when I was looking at the history of GR for the textbook I was working on about 20 years ago that the main results (e.g. on cosmology, the bending of light and on the perihelion of mercury) are spread over a large number of rather short papers rather than all being in one big one. I guess that was the style of the times! Astronomy is one of the oldest scientific disciplines. Human beings have certainly been fascinated by goings-on in the night sky since prehistoric times, so perhaps astronomy is evidence that the urge to make sense of the Universe around us, and our own relationship to it, is an essential part of what it means to be human. Part of the motivation for astronomy in more recent times is practical. The regular motions of the stars across the celestial sphere help us to orient ourselves on the Earth’s surface, and to navigate the oceans. But there are deeper reasons too. Our brains seem to be made for problem-solving. We like to ask questions and to try to answer them, even if this leads us into difficult and confusing conceptual territory. And the deepest questions of all concern the Cosmos as a whole. How big is the Universe? What is it made of? How did it begin? How will it end? How can we hope to answer these questions? Do these questions even make sense? The last century has witnessed a revolution in our understanding of the nature of the Universe of space and time. Huge improvements in the technology of astronomical instrumentation have played a fundamental role in these advances. Light travels extremely quickly (around 300,000 km per second) but we can now see objects so far away that the light we gather from them has taken billions of years to reach our telescopes and detectors. Using such observations we can tell that the Universe was very different in the past from what it looks like in the here and now. In particular, we know that the vast agglomerations of stars known as galaxies are rushing apart from one another; the Universe is expanding. Turning the clock back on this expansion leads us to the conclusion that everything was much denser in the past than it is now, and that there existed a time, before galaxies were born, when all the matter that existed was hotter than the Sun. This picture of the origin and evolution is what we call the Big Bang, and it is now so firmly established that its name has passed into popular usage. But how did we arrive at this description? Not by observation alone, for observations are nothing without a conceptual framework within which to interpret them, but through a complex interplay between data and theoretical conjectures that has taken us on a journey with many false starts and dead ends and which has only slowly led us to a scheme that makes conceptual sense to our own minds as well as providing a satisfactory fit to the available measurements. A particularly relevant aspect of this process is the establishment of the scale of astronomical distances. The basic problem here is that even the nearest stars are too remote for us to reach them physically. Indeed most stars can’t even be resolved by a telescope and are thus indistinguishable from points of light. The intensity of light received falls off as the inverse-square of the distance of the source, so if we knew the luminosity of each star we could work out its distance from us by measuring how much light we detect. Unfortunately, however, stars vary considerably in luminosity from one to another. So how can we tell the difference between a dim star that’s relatively nearby and a more luminous object much further away? Over the centuries, astronomers have developed a battery of techniques to resolve this tricky conundrum. The first step involves the fact that terrestrial telescopes share the Earth’s motion around the Sun, so we’re not actually observing stars in the sky from the same vantage point all year round. Observed from opposite extremes of the Earth’s orbit (i.e. at an interval of six months) a star appears to change position in the sky, an effect known as parallax. If the size of the Earth’s orbit is known, which it is, an accurate measurement of the change of angular position of the star can yield its distance. The problem is that this effect is tiny, even for nearby stars, and it is immeasurably small for distant ones. Nevertheless, this method has successfully established the first “rung” on a cosmic distance ladder. Sufficiently many stellar distances have been measured this way to enable astronomers to understand and classify different types of star by their intrinsic properties. A particular type of variable star called a Cepheid variable emerged from these studies as a form of “standard candle”; such a star pulsates with a well-defined period that depends on its intrinsic brightness so by measuring the time-variation of its apparent brightness we can tell how bright it actually is, and hence its distance. Since these stars are typically very luminous they can be observed at great distances, which can be accurately calibrated using measured parallaxes of more nearby examples. Cepheid variables are not the only distance indicators available to astronomers, but they have proved particularly important in establishing the scale of our Universe. For centuries astronomers have known that our own star, the Sun, is just one of billions arranged in an enormous disk-like structure, our Galaxy, called the Milky Way. But dotted around the sky are curious objects known as nebulae. These do not look at all like stars; they are extended, fuzzy, objects similar in shape to the Milky Way. Could they be other galaxies, seen at enormous distances, or are they much smaller objects inside our own Galaxy? Only a century ago nobody really knew the answer to that question. Eventually, after the construction of more powerful telescopes, astronomers spotted Cepheid variables in these nebulae and established that they were far too distant to be within the Milky Way but were in fact structures like our own Galaxy. This realization revealed the Cosmos to be much larger than most astronomers had previously imagined; conceptually speaking, the Universe had expanded. Soon, measurements of the spectra of light coming from extragalactic nebulae demonstrated that the Universe was actually expanding physically too. The evidence suggested that all distant galaxies were rushing away from our own with speed proportional to their distance from us, an effect now known as Hubble’s Law, after the astronomer Edwin Hubble who played a major role in its discovery. A convincing theoretical interpretation of this astonishing result was only found with the adoption of Einstein’s General Theory of Relativity, a radically new conception of how gravity manifests itself as an effect of the behaviour of space-time. Whereas previously space and time were regarded as separate and absolute notions, providing an unchanging and impassive stage upon which material bodies interact, after Einstein space-time became a participant in the action, both influencing, and being influenced, by matter in motion. The space that seemed to separate galaxies from one another, was now seen to bind them together. Hubble’s Law emerges from this picture as a natural consequence an expanding Universe, considered not as a collection of galaxies moving through static space but embedded in a space which is itself evolving dynamically. Light rays get bent and distorted as they travel through, and are influenced by, the changing landscape of space-time the encounter along their journey. Einstein’s theory provides the theoretical foundations needed to construct a coherent framework for the interpretation of observations of the most distant astronomical objects, but only at the cost of demanding a radical reformulation of some fundamental concepts. The idea of space as an entity, with its own geometry and dynamics, is so central to general relativity that one can hardly avoid asking what it is space in itself, i.e. what is its nature? Outside astronomy we tend to regard space as being the nothingness that lies in between the “things” (i.e. material bodies of one sort or another). Alternatively, when discussing a building (such as an art gallery) “a space” is usually described in terms of the boundaries enclosing it or by the way it is lit; it does not have attributes of its own other than those it derives from something else. But space is not simply an absence of things. If it has geometry and dynamics it has to be something rather than nothing, even if the nature of that something is extremely difficult to grasp. Recent observations, for example, suggest that even a pure vacuum of “empty space” possesses “dark energy” energy of its own. This inference hinges on the type Ia supernova, a type of stellar explosion so luminous it can (briefly) outshine an entire galaxy before gradually fading away. These cataclysmic events can be used as distance indicators because their peak brightness correlates with the rate at which they fade. Type Ia supernovae can be detected at far greater distances than Cepheids, at such huge distances in fact that the Universe might be only about half its current size when light set out from them. The problem is that the more distant supernovae look fainter, and consequently at greater distances, than expected if the expansion of the Universe were gradually slowing down, as it should if there were no dark energy. At present there is no theory that can fully account for the existence of vacuum energy, but it is possible that it might eventually be explained by the behaviour of the quantum fields that arise in the theory of elementary particles. This could lead to a unified description of the inner space of subatomic matter and the outer space of general relativity, which has been the goal of many physicists for a considerable time. That would be a spectacular achievement but, as with everything else in science, it will only work out if we have the correct conceptual framework.